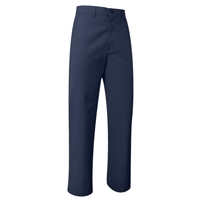 Ladies navy work pants are 65/35% poly/cotton. Side elastics allow for 2" of waist expansion. Inset rear pockets. Sizes 4-24 even only. Please specify inseam for hemming.